were removed from the home. The teen and her younger sister won such damages when suing the county/DCF agency worker's." $400,000 lawsuit for civil right damages pursuant to U.S.C.A.Title 42 Section 83 along with other various torts, involving such children who were placed under the direct care and supervision of a state worker and his agency." Such children were injured, psychologically and emotionally, physically for some time while the state worker had a duty to protect child once the child was removed from their home." More to be discussed this week! (During your comprehensive 1-on-1 session when you are instituting your warranted civil rights lawsuit for damages against child protection services employees." 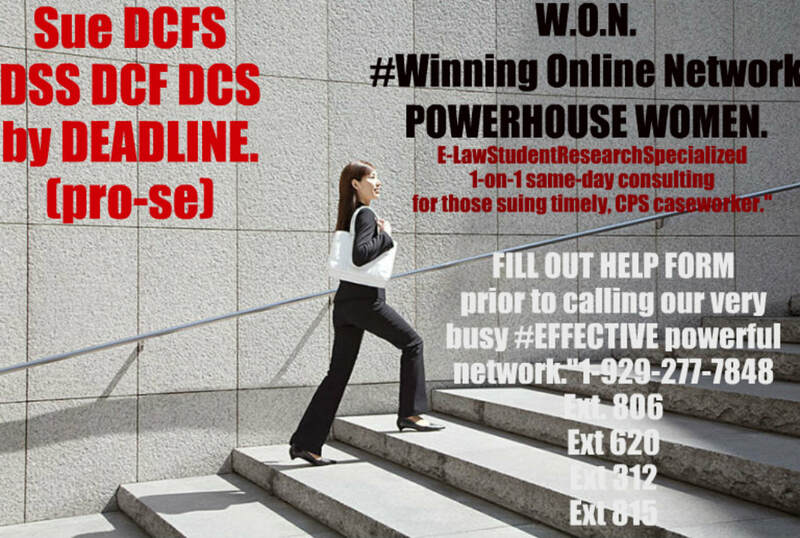 ​ 1 of a kind popular WON e-lawstudent #winning consulting 1-on-1 network, for those suing without a lawyer known as pro-se." Section 83,85,86 under Title 42 and other various torts, related to your own pain,suffering, per violation caused by D.C.F.S. Facebook page, or by clicking here, call in." eastern til 10:p.m..,Holidays til 2 p.m.